Remote control car starter systems are a true revolution. They enable you to start your car remotely without having to enter it. The remote car starters are important when you want to warm your car before you access it. The system enables you to set the air condition of your car so that by the time you enter it, it is to your desired condition. Choosing the right remote car system is not easy. After trying out different types, we finally settled on Python 5706P Responder security remote as our top pick. The Python 5706 P has excellent features, it’s stylish and manufactured using quality material. The Python 5706P is among the best-selling remote systems on the market. The unit has a long range that is very impressive. It maintains the temperature in the car and the 2 way remote lets you know what it is doing. You also know when your car starts and when it shuts down. The remote is easy to use and has a built-in rechargeable battery that makes it convenient. The unit has a built-in shock sensor like most systems and has an adjustable knob for sensitivity. It supports multiple inputs for the use of additional sensors like proximity and tilt. Comparing this remote car starter with others of similar pricing, we concluded that Python 5706P is a champion for its design and features. It is our recommended top pick. The Viper 5706v was what we chose as the step-up pick. It is a product from Viper who are renowned manufacturers of car security products and starters. The product has highly innovative features that have seen it become among the bestselling remote car starters. We really liked the smartphone app that allows a car owner to control his remote start from the phone. The product has one-mile range remote start system with 5 button LCD transmitter. Should anything happen to your vehicle, you are notified right away by the Responder LC3 provided you are within the one-mile range. It does so by playing sirens when you open your doors. The LCD spells out exactly what happened to your car. Another feature we liked was Keyless Entry that enables lock and unlocks tasks remotely. It is a wonderful security feature that ensures no one can enter your car without your wireless transmitter. Viper 5706v can perform 24 different functions on your car. The AutoPage C3 RS 730 is a high-quality remote car starter unit that is affordably priced. It features an excellent design afforded by Autopage Inc. who have more than 25-year experience in the car security industry. The remote car starter has a great range of about 1 mile. It has an excellent LCD screen that has 7 – color backlighting. This product has a long battery life and a power spare mode. It embodies high – tech chrome finishes coupled with a wonderful looking leather cap for the key ring. We also were impressed when we tested it and highly recommend it to those who want to spend less on a product with superior features. Buying the best remote car starter is not an easy task. There are remote car starters of high quality as there are equally car starters of poor quality in the market. We have tried to educate you on how to identify the appropriate gadget that will give you value for your money. If you only require a remote car starter for starting and stopping the car, there is no need for buying an expensive gadget. But if you are looking for a remote car starter that has lots of functions then you can go for a unit like our top pick the Python 5706P. The price of the remote car starter is very important. There are very expensive remote systems while there are also fairly priced units. We would like to state that in some instances, a highly priced remote starter is not necessary the best for your needs. Before you go purchasing, it is advisable to arm yourself with information on the available units on the market, their price range and reviews from clients who bought and used the gadget. The most important factor is to purchase a unit that best satisfies your needs. Remote Car starter systems that are highly integrated with great features and functionality are always expensive compared to simple units. We came across simple yet wonderful gadgets a good example being the SCYTEK GALAXY G5. It is simple yet very reliable. On the other hand, a unit like our step up pick the Viper 5706v has many features. A remote car starter is a radio controlled device installed in a vehicle that pre – heats or cools the vehicle before the owner gets in. The gadget can start or stop the engine of the vehicle by pushing a button on the key chain. You can set the engine to run for a specified time after which it automatically switches off. Remote car starters have added features like alarm systems to notify the owner of any intrusion to his vehicle. The style and design of the unit were one of the parameters that we used in our review. Many consumers are looking for something sleek and trendy. The slimmer, the better so that it does not become a burden carrying it in the pocket. The kind of display that comes with the device was also under consideration. We were looking at whether the unit comes with LCD, Dotted, LCD Text, etc. The technology of the display was of importance when coming up with our main picks. We also considered the constituent features of the units. We looked at the range. The range is important for it enables a person to control his car from a great distance or a very short one. Also, we were looking at whether the transmission was affected by blockages. Other features we looked at were Auxiliary Outputs, 2-way paging among others. The price of the remote car starter was at play. But, we were looking at the price in comparison with the features. Our top pick had great features and so was our step up pick. The big difference in pricing was what informed us in choosing one as our main pick and the other as our step up pick. When selecting the best remote car starter system, it is wise to consider the manufacturer. The manufacturer who specializes in producing remote car starters is more likely to produce a high-quality product than one that is not experienced in the field. The track record of the manufacturer is vital and really helped us in identifying products of the highest quality and that can be trusted. We also considered the kind and quality of materials used in manufacturing the remote car starters. We submit that a good remote car starter system should have a method of monitoring the engine RPMs. In cold seasons, the engine may not start with the first time. A good starter will show that the engine is not working so you can retry. The functionality is also important as an Over rev – protection. You are able to know whether your engine speed is too high which might damage your vehicle. It was among the factors that informed us into choosing our main picks. We used the above criteria and much more in order to help you in understanding the remote car starters. However, we maintain that the ideal remote car starter will depend very much with the needs of the user. The price was perfect compared to other starters of the same features. Viper 5706P offers the longest range in our history up to a full mile using Digital Spread Spectrum Technology (SST). The importance of SST is that it uses digital frequency hopping and multiple frequency transmission to ensure that if there is a blockage, the signal still goes through. It embodies smart start features that allow you to remote start lock or unlock your car by use of a smartphone. This is enabled by a smart start app from Direct Electronics. The remote car starter has a full one – Mile Range that enables you to start your car from a great distance. It has Lock/arm, Unlock/disarm, Remote Start, Trunk release, and panic or car finder. We were able to start our car one mile away even when there were several blockages. The Remote can confirm commands with tones, vibration, and icon display. It uses SuperCode technology that defines the functionality of the Responder. Its protocol incorporates software – based system signal encryption. The SuperCode supports multi – car operation which enables the control of two cars using one remote. You can assign more than one user to control a vehicle. The unit enables you to know what is happening to your vehicle by receiving notifications of many different events. We can submit that Python 5706P is the market leader in notifying the user about the whereabouts of his vehicle. Many online reviews of customers who have purchased the remote car system were in full praise of its features and performance. Python 5706P was our ultimate pick, we recommend it to anyone looking for a fairly priced remote car starter that is laden with excellent features. It is also great for family use because it can control two cars and can be used by more than one person to control a car. The only drawback with the Python 5706P is that it doesn’t have enough support for self-installation. You must hire services of an authorized dealer for installation which mean additional costs. However, the benefits that come with the unit greatly outweigh the con. It is a complete security and remote start key system which features a user-friendly remote that has priority icons and an LCD display. It has five buttons that control 24 different functions on two vehicles. The display shows lock/unlock, arm/disarm and trunk release status on the screen. Warnings are displayed accordingly to alert you if your vehicle is being tampered with. You are also shown on the display the specific part of your vehicle that was tampered with. The gadget is the slimmest on the market. It is the 3rd generation of Responder that comes with SST One Mile Range. The one-mile range enabled us to operate the functions of our vehicle from a long distance. We were able to perform functions such as closing the doors of our vehicle remotely. It has an onboard lithium – ion rechargeable battery with micro –USB recharging. The remote car starter provides comprehensive monitoring of your vehicle. If you select temperature check, the Responder will display the temperature in either Fahrenheit or Celsius. This allows you to know the actual temperature in your vehicle from a distance. Should you want to increase the temperature, you simply use Runtime Reset that extends your runtime. Viper 5706v has a Dual Zone Shocker Sensor that uses warning chirps for minor disturbances but trips the alarm for serious disruptions. The sensors reduce false alarms. We also liked the Dedicated Trunk Release that comes with the unit. We were able to pop our trunk using our remote transmitter and we can report that it was very convenient when carrying language. The 5706v is Viper SmartStart Compatible with Bluetooth, SmartStart Module with GPS Tracking. Other features that make the remote car starter to rank high are the D2A Serial Data Port that gives installers plug – and – play connection to all the other XPRESSKIT interfaces, Flex Relays Onboard for Remote Start and Light Flash that eliminates the need for additional relays, a Control Center that combines the status LED and valet Switch with the 2 – way Antenna that is valuable for eliminating drilling of holes in the dashboard. We highly recommend the Viper 5706v Remote Car Starter for those who are willing to pay more for a car starter with incredible features. It is definitely our step up pick. Autopage, Inc. the manufacturers of Auto page C3 RS 730 have more than 25 years’ experience in the motor vehicle security industry. They have consistently produced high-quality car security products to the market. Autopage C3 RS730 LCD is one such gadget. It commands a lot of positive online reviews from persons who have used it. The remote car starter has excellent features and its pricing makes it stand out from the rest. The gadget stands out for having lots of customization alternatives, 2 Car functionality, and a vibrating remote control. Some of the features are a 2- way, 4- channel Car Alarm. The alarm comes with Remote Car Starter 4 Channel with 5 on – board relays for parking lights, starter, accessories, ignition 1 & 2. The design features new High – Tech chrome metal finish with smart – looking leather strap for the key ring. It comes complete with LCD screen with 50% more viewing space that incorporates 7- color selectable backlighting, On – board temperature sensor, Two car operation, power hour advanced clock that has a number down lock that stops the meter update. We were impressed with the long battery life of around 2 – 3 weeks. It uses one AAA sort 1.5-volt antacid battery with battery life marker and power spare mode VT33. Another feature that we liked is the New Design Two – way window mounts super extended range helical trans-receiver antenna module and new EMS – 1 mini – size Dual Stage shock sensor. The Autopage – C3 Rs730 LCD has a 1 – Mile ranging which is a great distance. The remote is furnished with a presentation screen that enabled us to screen our vehicle at all times. This unit has features that can only be found in highly priced remote car starters. The Autopage C3 – RS730 Remote car starter is a good choice for homes with more than one vehicle. We picked it as our budget pick and highly recommend it to anyone looking for a high-quality remote car starter that is affordably priced. The AVITAL 303L Security Remote System is what we selected as the best anti – theft unit. Some of its features that informed us into selecting it as the best anti – theft remote car starter were its Remote Start Security System with Keyless Entry, active and passive arming, Multi – level security arming that allows the user to select which of the inputs or sensors will be active and which will be bypassed. It also has a panic mode that will sound an alarm and flash your parking lights and a 4 AUX output anti – theft gadget. It comes with 1 LCD remote and one 4 – button remote. The remote car starter has proximity sensors that work perfectly well. Some reviewers complained that the proximity sensors relay a lot of “warn away chirps” even when cats seat beside the vehicle or when morning dew evaporates off the screen. We submit that’s what total anti-theft security system is all about. 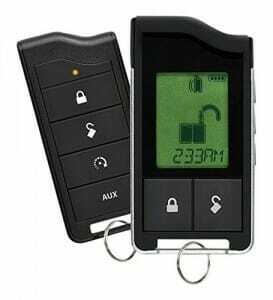 If you park your car in an area where car theft is rampant, it is wise to consider investing in the AVITAL 303L Security Remote System that will put you on top of your vehicles security. We picked the Directed Avital Way Security System as a worthy competitor to our main picks. It has a primary remote that has tone and vibrate modes, command confirmations and event notifications via the LCD remote control. The starter has 2-Way LCD 5-button remote, One – way function with the 4 – button companion remote and relays on board for door locks, starter kill, parking light, and dome light. The unit has the capacity to arm or disarm your system with the push of a button. It has a range of about 1,500 feet. It is a simple yet brilliant car starter that is affordably priced. Many customer reviews we went through praised the Directed Avital’s performance. We also recommend it in case you are not able to get hold of our main picks. According to Avital’s website, the system has fault – proof starter interrupt and a zone – impact sensor. This is a good performer. Coming from a renowned manufacturer, Viper has some great features that include a 5 – button Remote Control Transmitter, a One – Mile range with keyless Entry, Temp Check Technology, and Visual LED Command Confirmations. We really liked the built – in temperature sensor on the box. Many reviews complain of difficulty in installation. The remote car starter is meant to be installed by a certified Viper technician well conversant with the viper language. We also state that it would have been better if the unit came with two 2 – way remote instead of one 1 – way remote. Overall, it is sturdy and of good quality. This is another worthy competitor. Among its features is security system with remote start and keyless entry, stinger Double – Guard Shock sensor with Warn – away, fail- safe kill and 4 – button remote. The remote works well and has a great radius. Avital is a brand manufactured by Directed Electronics who have experience and track record of producing high – end stuff that is a leader in the market such as Viper, Python Clifford etc. The quality of this unit is great and has a built – in rechargeable battery that is very convenient. We recommend the AVITAL 5103L Security Remote System as a good substitute to our main picks. It is a 2 – way Security and Remote Start System which lets you know what is happening to your car. It features SST Technology, 1 Responder HD Color 2 – way Remote and 1 5 – Button 1 – Way Remote. The Directed Electronics 5906P is a great unit that has a user-friendly interface and can be programmed from the remote to your specific needs. It has a very impressive range of up to 1 Mile. It gives you the temperature in your vehicle and can be used for many other functions. The remote is rugged and easy to use, and the built-in rechargeable battery is very convenient. Save for the price which is on the higher side, it is a good substitute to our main picks. It has One 5 Button LCD Chrome 2 – Way Remote Control with Auto Clock Adjust and a range of up to 3000 feet. It comes with a built – in programmable (+/-) Parking and Interior Light Relays. According to SYSTEK, the remote car starter features Engine Start System with Keyless Entry, True RPM sensing for Real Time Cranking, MobiLink, Cellphone and Tracking Compatibility, and is compatible with all vehicles. Can I self – install the remote starter? It is not advisable to install the device on your own. The installation involves complex programming that is better left to an expert authorized by the manufacturer. Can installing the remote starter nullify the vehicles warranty? Can my vehicle be stolen while the remote starter is active? It is not possible because the remote starter locks the steering wheel, transmission lock, and the transmission system. Your car can only be started by the valid key. Can I transfer a remote starter from one car to another? Yes, you can. But, remember you will undergo installation expenses once again which is counterproductive. It is not advisable for it may affect your warranty. Purchasing the appropriate remote car starter system isn’t an easy task. Our reviews has identified the best remote car starter systems to help you save time and make an informed decision when buying a remote car starter. After rigorous research that saw us test many remote car starters presently in the market, we ended with the Python 5706P Responder Security System as our top pick. The remote car starter has excellent features and fair pricing. We identified the Viper 5706v -2- Way Car Security as our step up pick for those who don’t mind paying more for a remote starter of excellent performance. We also cared to identify a remote car starter for those who want an affordably priced unit but of reliable performance and quality. Our budget pick for them was the Autopage – C3 – RS730LCD. We also identified other remote car starters of equally good quality that are valid substitutes to our main picks.